The fourth installment of the Georgia Elite Classic is poised for an all-star marathon on December 29 at McEachern High School that will showcase five games for the first time. Last year saw the annual junior all-star game add a sophomore game for the first time. The sophomore and junior all-star games will once again cap off the three days of activities, practice and competition. Before the final two games, however, will be a seventh grade game, an eighth grade game and a senior game for the first time. The seventh grade game will start at 9 a.m., and with neighboring practice fields surrounding the stadium, the next teams can start warming up on schedule to keep the event running seamlessly. The eighth grade game is slated for an 11 a.m. kickoff. At 1 p.m. is an intriguing new format that will showcase the state’s top uncommitted seniors. The selection process for the senior game will begin in November and this will give college football hopefuls a chance to gain interest and boost their rank as National Signing Day sits several weeks away. Born to Compete is teaming up with the Georgia Elite Classic to put on the seventh and eight grade games. Born to Compete or (B2C) is a media website for youth sports that offers coaches, family members, and young athletes from ages 6-14 an outlet to celebrate and support their athletic endeavors. B2C’s media coverage spans several states including Georgia, Maryland, Virginia, California, Alabama, New York, Rhode Island, Delaware, Michigan, Indiana, Kentucky, North Carolina, Arizona, Florida, Louisiana, Texas, Ohio, and Tennessee. With five all-star games, the Junior Elite Classic Showcases currently touring the state will present opportunities for players to earn a place in December’s games. Two showcases remain in April starting the 17th at Walton High School and the 24th at Devaul Henderson Park in Richmond Hill. The showcases are spread throughout the spring and across the state to give each region of Georgia the proper exposure. 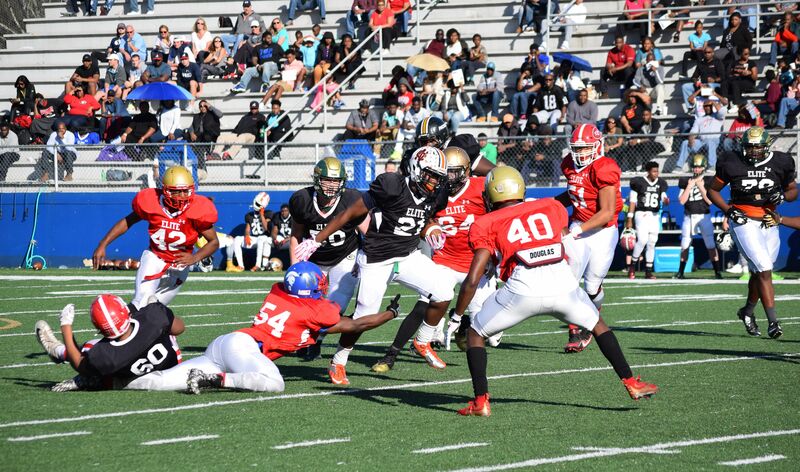 Gwinnett County’s event will be held on May 1 with the location still to be determined and on Dec. 18 it will be Cobb County’s time to shine again as McEachern holds the final showcase of the year with more roster spots on the line.